By Ross Elliott - posted Tuesday, 22 September 2015 Sign Up for free e-mail updates! In another 85 years, the world will be a very different place. Some nations are already shrinking and have much further to go, while others will grow dramatically. The world powers in economic and military strength are going to change. New stars will rise. Old stars will fade. So I thought it might be interesting to see how Australia might look by the year 2100, compared with some of our major trading partners or world powers. Australia’s population will rise from around 24 million now to about 33 million by 2050 and to 42 million by 2100. That might sound like a lot but an extra 20 million of us over the next 85 years is a minor statistical error in global terms, although given recent trends we could be a world stand out with 85 Prime Ministers in as many years. What many people don’t seem to appreciate is that China’s population is at its virtual peak, and is about to start shrinking. 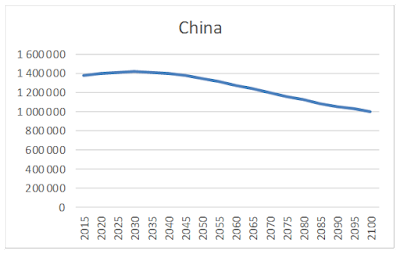 China will peak at around 1.415 billion people in 2030 and by 2050 there will be nearly 70 million less Chinese than at this peak. By 2100, there will be 372 million fewer Chinese than today and over 410 million less than the peak in 2030. They are also aging faster than their workforce can keep up with, although on the plus side, there is still plenty of room for productivity growth in China. Their current GDP Per capita is USD $7,500, compared to nearly USD $62,000 in Australia. (World Bank data). 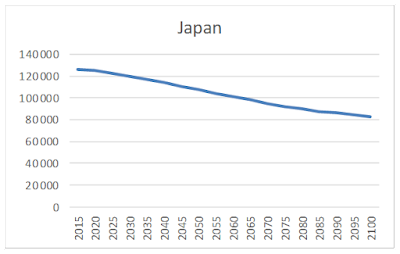 Japan is forecast to have a steadily declining population. 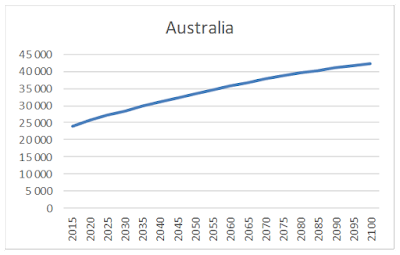 By 2050, it will have shrunk by 19 million people (that’s getting close to the current population of Australia) and by 2100 it will have shrunk by more than 43 million people. Those inflated real estate prices might be under pressure, which could do all sorts of things to the economy’s capital backing. They’re already reasonably productive and with a rapidly aging population, it looks like the land of setting – not rising – sun for them. 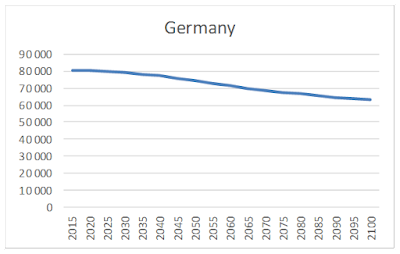 Germany’s population is also in gradual decline. 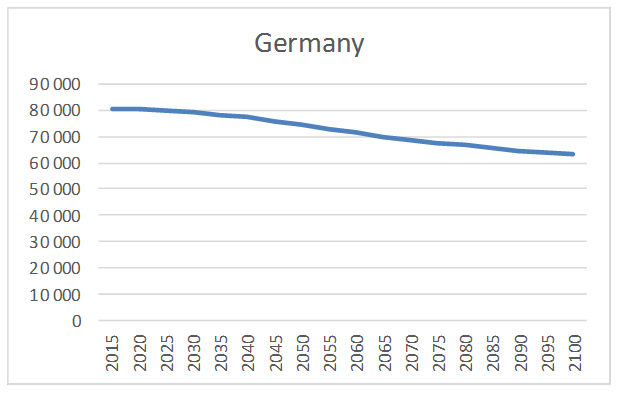 There will be roughly 5 million fewer Germans by 2050 and by 2100 there will be 17.5 million fewer Germans than today. All those empty beer halls! Little wonder the Germans are happy to accept large numbers of Syrian refugees – they have a highly productive economy but will have fewer people to keep it running. India takes over from China as the world’s most populous nation within the next five years or so. By 2050 they will have added nearly 400 million more people. Their population peaks in 2070 at 1.75 billion (give or take an Australia or two) and declines to around 1.66 billion by 2100 – which is still some 355 million more than today. 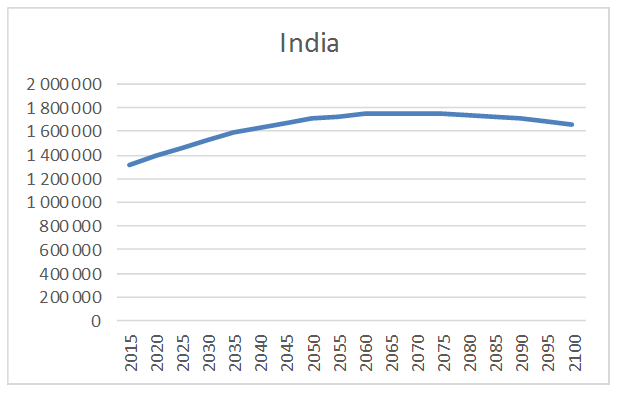 India has massive potential for productivity growth with a current GDP per capita of only USD $1,630 – which is 2.5% of Australia’s. They have a western democratic system of government but seem to have adopted the least efficient aspects of western bureaucracy with few of the benefits. If they can resolve their governance failings and modernise their economy, India may well be a new world super power by 2100. If you have kids in primary school today, maybe getting them to learn the Hindi language is not a bad idea. At least they’ll be able to follow all those Bollywood movies.